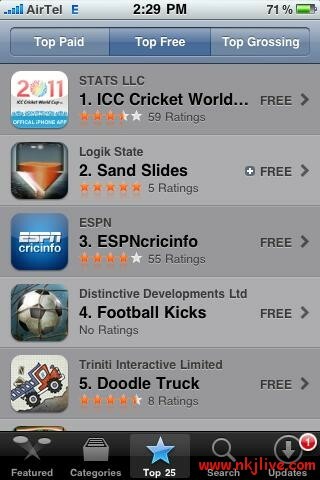 The ongoing ICC Cricket world cup 2011 in Indian subcontinent is trending in Apple India App store too. After its miraculous start and soothing theme songs, people all over the world specially in India are spending more and more time on either their TV sets watching live or running some stream online to watch their favorite teams playing. If they have no access to either of them then they are at least fetching the scores regularly from some or the other source. One of the best source these days is thousands of apps available for different operating systems, be it android, RIM, iOS or any other. And believe me they are getting huge popularity as huge majority has smart phones running these apps nowadays. Even International Cricket Council (ICC) released their official app for iPhone for the smartest gadget users to know scores anytime anywhere, and within a week of its release it is at the top of free apps in the Apple App store. Other than it, over all 3 apps are in top 10 i.e. downloaded most. 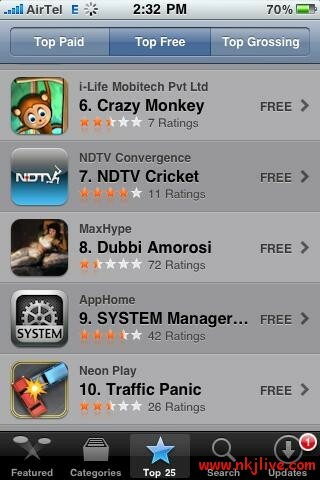 Other apps are ESPNcricinfo and NDTV Cricket. Cricket is really trending in India but to my surprise not on twitter or facebook lately. But I am really hoping it will soon start to attract more and more people on twitter and other social medias as the world cup will progress. KKR’s New Logo : New Luck ? ?